Domaine Chandon gets everyone in the mood and asks What would Cupid do ? Domaine Chandon was Founded in 1973 and the first American sparkling wine venture established by a French Champagne house (Moët & Chandon). They craft a range of sparkling wines that reflect California regional character yet remain true to the ancient practices of méthode traditionnelle. Domaine Chandon is at the forefront of sustainable farming practices and continues to replenish, control, and in many cases restore the natural habitat. Domaine Chandon's acclaimed fine dining restaurant étoile received a star rating in the 2010 Michelin Guide. The winery was selected "Winery of the Year 2005" by the California Tourism Association. For this Valentines Day , Chandon has created a fun a micro site for lovers seeking creative inspiration and more for their Valentines celebrations. www.chandon.com/valentine offers original ideas and suggested cocktail and meal recipes, as well as helpful hints on ways to charm and enchant your love . Taking inspiration from the original God of Love, www.chandon.com/valentine is affectionately known as “What Would Cupid Do?” and offers creative Valentines suggestions in addition to the expected dinner out. The site has ideas based on the time of day you will be celebrating Valentines Day and geo-targets suggestions based on your zip code location. www.chandon.com/valentine is viewable on iPhones and iPads. It offers great ways to captivate your loved one, such as surprising your significant other with bubbles in bed, or starting your day with dessert and creating a romantic déjà vu by recreating your very first date. For the traditional Valentine's day dinner, there is a "Dine with Chandon" section, which recommends local restaurants that serve Chandon (with a link to make a reservation). Before your romantic dinner get things started with a cocktail to sweeten up your Valentine, Chandon suggests the Love Potion. Rim a chilled martini glass with red sugar. In an ice-filled cocktail shaker, combine one ounce cranberry simple syrup (recipe below) and ½ ounce fresh-squeezed orange juice. 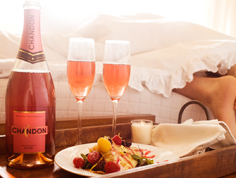 Shake until chilled, strain into glass, and top with three ounces Chandon Sparkling Rosé. Enjoy and repeat! 1 cup unsweetened cranberry juice? 1 cup sugar of choice.Combine in a heavy saucepan on low heat. Stir until sugar is dissolved. Store in glass jar in the fridge. Yields 1 1/4 cup. Be sure to check out chandon.com/valentine for other great cocktails with food pairings, and for more reasons to celebrate everyday, please visit http://www.chandon.com/365/chandon-365.ics to download Chandon’s 365 Reasons to Celebrate calendar to your desktop or go to www.facebook.com/chandon and click on the 365 tab. We had to indulge ourselves with some lovely "bubbles" from Chandon to get the romantic season started right . We started with the Blanc de Noirs. Eventhough it is made from Pinot Noir the color is golden straw. On the palate and the wine is light with raspberry and strawberry flavors jumping out with every sip. Many may not realize that Domaine Chandon is a Pinot Noir house. For more than a quarter of a century, their Brut, Blanc de Noirs and Reserve have been based upon Pinot Noir and its cousin Pinot Meunier. To show off these noble red varietals, they created a unique and distinctive style of Blanc de Noirs in 1974. Since then, this fruit-driven, full-flavored sparkling wine, featuring Pinot Noir and Pinot Meunier, has become one of Chandon's most popular. We had to go back to the classics , and we did , with Chandon's Brut Classic. Made using méthode traditionnelle, this wine goes through second fermentation in the bottle and is made from the traditional Champagne varieties of Chardonnay, Pinot Noir and Pinot Meunier. Chandon Brut Classic on the palate displays apple and pear flavors and aromas and spice that leads to a soft, dry finish. The Brut Classic is blended with ten to twenty percent Reserve wines from prior harvests. 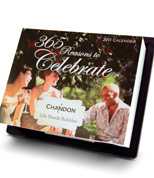 Completing the Chandon portfolio with a sparkling for every mood and occasion. We enjoyed The Chandon Sparkling Rose which is also perfect for your very special valentine . This Sparkling is lovely in flavor and appearance due to the addition of still Pinot Noir at tirage, a winemaking choice which defines the style. Fruit for the sparkling base wine is harvested early for delicate flavor, crispness and lower alcohol. Still wine grapes are picked at greater ripeness for intense flavor development. Adding still Pinot Noir to the base wine at tirage provides deeper color and structure to this style, differentiating it from Blanc de Noirs. In the glass, the color is a deep pink and the palate explodes with ripe strawberry, juicy watermelon, and fresh red cherry fruit aromas as well as apple and pear . Sparkling wines are great for your very special occasions , but when you open a great Sparking wine from an American legendary producer like Chandon, Any day becomes a special occasion. Lets pop a cork and enjoy some of the best USA has to offer.